Scott #468: 1944 6c Brown VICTORY Ovpt. One the Rarest stamps from the Philippines. Reverse (Gum Side): "Tropical" Original gum. Faults / Imperfections: Faint gum bend and couple of tiny perf faults. The item pictured is the actual item you are purchasing, unless otherwise noted. I also offer an interest-free layaway plan. About Getting This Stamp Expertized. My Professional Service To Sell Your Stamps. Some of My 50,000+ Feedback Comments. Websites You Should Visit Stamp Collectors Against Dodgy Sellers. 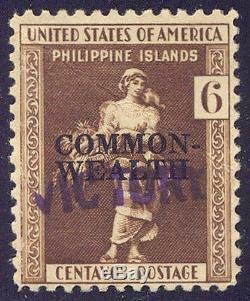 The item "PHILIPPINES #468 RARE Mint withCert 1944 6c Brown VICTORY Ovpt" is in sale since Saturday, June 28, 2014. This item is in the category "Stamps\United States\Possessions". The seller is "gsquared7" and is located in Ankeny, Iowa.